We can learn a lot from the Fool about trusting our innate creativity. He teaches us how to be in the present moment, how to move forward even when we’re not sure where we’re going, and how to take risks without worrying about failing. 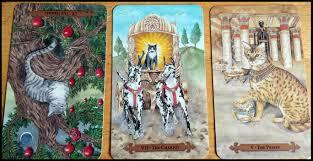 One of the easiest ways to access the energy of a particular card is to imagine yourself as the figure in the card. Close your eyes, relax, and see the image of the card in front of you. Visualize the card enlarged and in 3D, until it becomes a real landscape. Now imagine yourself as The Fool in the card. Feel the sun on your back and the staff on your shoulder, and smell the white rose in your hand. Bend over and pat the dog. Stand up, and look out over the land far below. What do you see? Take careful note of what you see, so that you can write it in your journal later. Enjoy being The Fool for a few moments, then step out of the card. See the card shrinking until it’s just a cardboard picture again. Open your eyes. How do you feel? Has anything changed? Take a moment to write your insights into your journal. Remember how it felt to be The Fool, and take that energy with you as you go through your day. How much of your life are you living? Creativity requires that you be present, in the moment. If you’re finding it difficult to be in the present moment, lighten up. Be Foolish. Laugh! Go and watch a funny movie, or take the kids to the park. Focus on your breathing. As soon as you focus on your breathing, you will be in the present moment, you literally can’t be anywhere else. If you’re alone, close your eyes and imagine that you’re sitting on The Fool’s mountaintop, and simply breathe and enjoy the view. One more step and The Fool might just go over that cliff. But he doesn’t look too concerned, does he? He looks as if he’s enjoying himself, whistling a happy tune. Where are you stuck in your life? Creativity is about movement. What Foolish step can you take, even if you fall off a cliff? Focus on your breathing, stay in the present moment, and take that next step. By the time we’re adults and have completed our education, we’ve usually had most of the spirit educated out of us. By the time we reach middle age, we’ve been disappointed so many times that we assume that our lives will always be the same. We forget the 10 card, the Wheel of Fortune, which is always turning. What would you do if you knew you couldn’t fail? 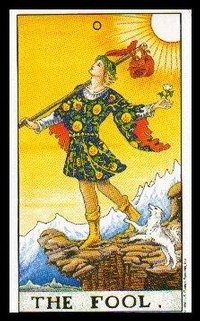 The Fool reminds you that you can start all over, with a completely clean slate, any time you want to. What risk can you take today? Can you start a new creative project? Apply for a new job? Move to a new city, or a new country? This is a fine way to be. Remember The Fool. Be in the present moment. Take the next step. Focus on your breath. Take a Foolish risk. 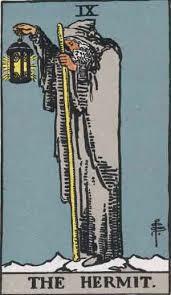 Access The Fool’s energy to help you through it.